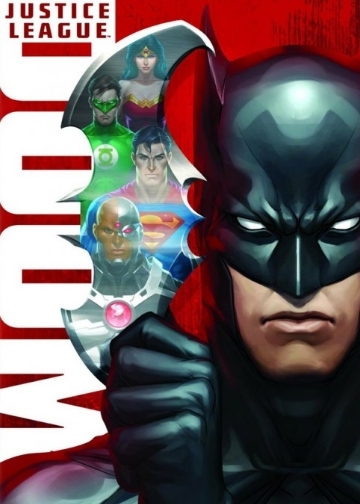 yesterday dc released the animated feature, "justice league: doom". just a little fyi: my husband & i LOVED the justice league animated series. complex & progressive storylines, continuity, character growth & interaction, smooth animation. what was not to love about it? was also very pleased that most of the original voice actors in the animated series came back to work on this feature. batman = kevin conroy. period. ok, i can already tell some of you are confused by this. why is this 30something yr old woman writing about a cartoon? age ain't nuthin but a number, & my love for the animated medium knows no bounds. AND, didn't you read the part in my bio about how my husband & i work on comic books? wow, dude. try to pay better attention, yeah? then maybe next time i start spouting about something geekish you won't be caught off guard. but "jl: doom" isn't really what i want this post to be about. 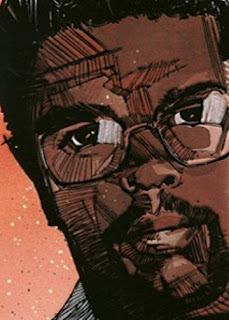 it's suppose to be about the late, great dwayne mcduffie. if you bought the bluray version of "jl: doom", you got to watch a special tribute/mini-documentary on him. it told about mcduffie as a child growing up in detroit & basically being a genius. he attended college at age 10 (say wha???). started his own comic book company, milestone, in the 90s which featured mainly a cast of african american heroes (kid hero static shock, anyone? ), practically unheard of at the time. then he went on to write for dc comics & their animation department. & that's where the justice league animated series came about. this guy was a genius, & here he was writing stories for a cartoon. i'm not downing that at all, trust me. mcduffie was one of the best things to happen to dc. use to be that the regular joe on the street didn't know about vibe or booster gold or shining knight unless he was into comic books. thanks to him, kids AND adults from all over, non-comic book readers, got a chance to know each & every dc character. it was how he made them interact w/ each other, like they weren't cookie cutter heroes. he gave them depth & personalities. aside from them having super strength or an invisible jet, you could relate to them. mcduffie passed away from complications during heart surgery last february. the script to "justice league: doom" was the last thing he worked on. after it went off, my husband & i decided to call it a night. it was late anyways. i noticed how quiet we both were when we went upstairs. he went to take a shower; i went to put the boy to bed. 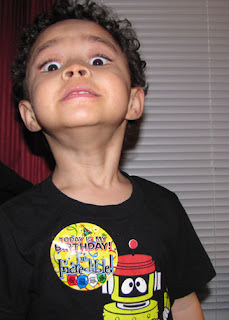 i sat on the floor in my son's room, in the dark, & stroked his hair till he went to sleep. & i quietly cried. i was sad as hell. i never even met the guy, & here i was crying because he was dead. why was that? because he was a creator who loved what he created. it showed. i couldn't help but feel like the world had lost a gift w/ his passing. i cried when i heard jim henson died, too. & aaliyah. we're all put on this earth to do something, & do it well. could be you're here because you can teach children & open their eyes to their own potentials. could be you're here because you can paint such beauty that would make someone pause in reflection. could be you're here to be mother & nurturer to a kid that will grow up to change people's ways of thinking. dwayne mcduffie was a storyteller. he wrote about human nature. how we can be our own worst enemies & greatest allies, where we fall short & how we rise above. just coincidence that the people he wrote about wore capes & tights. he insisted on a dramatic pose. like 1 that showed straight up his nose. a artist recruiter from pspproject.com asked if i was interested in doing artwork for their site. my husband tried it out a few years ago, but had to let it go because he got too busy w/ other freelance work & our graphic novel. i was no help in the art department because our son was still an infant, so i usually hung on to him while the hubby did the art thing. creativity stopped completely for me, sad to say, while our graphic novel production slowed to a crawl w/ just 1 person working on it. but that's life. you do what you gotta do to keep things going. now that the boy's almost 3 (wow, that hurts my <3 to type it) & can entertain himself w/ his gazillion action figures, i've managed to slowly get back into doing artwork. they've mainly been vector pinups, but hey, it's better than nothing, right? i'm also looking forward to inking a lot more comic book/graphic novel stuff again. the hubby's been a real trooper all this time. i know it stresses him out to do practically ALL the work w/ deadlines & such. i want to take some of that off his shoulders, bring his blood pressure down a notch or 2. & this psp tube thing is a nice opportunity to 1) make some extra $, & 2) encourage me to work on more art pieces. 1st brand spankin new post! woohoo! h'lo there. my name's janet, but i'm also known on the internetz as "saltygirl", the comic book pinup artist. my husband & i work on the Jetta: Tales of the Toshigawa graphic novel series where he mainly pencils & i ink & we both collaborate on storylines. sound fun, yeah? i'm starting this blog to help me get back into expressing myself w/ more than just a quick & clever sentence (facebook spoiled me). i'm into comic books, cartoons, taking naps, art, so this blog will house a lot of my musings or original creations, me enjoying fam time w/ my husband & son, & maybe the occassional geeky/nerdy rant about star wars or batman. that ok? on a more narcissistic note, this blog is also to help me fight the frump. oh you know what the frump is. don't pretend you don't. i don't know how it happened, but i've slowly become that woman, the 1 that looks too tired to care. i was never a gal who was into girlish things; i might be missing a girly gene or something. but i did know how to put an outfit together & look halfway decent. then 1 day i looked up & i was dressing like my almost 3yr old boy: sweatpants & a hoody. & it didn't help that my husband was 1 of the 2012 hotties for the memphis flyer. :( so yeah, this blog will have the occassional "look @ me! i can look purtty too!" post. what you most likely won't find on here? posts of hair &/or makeup tutorials. i have never figured these out. my hair is usually wash, comb, & go. & i can't wear makeup because my rosacea makes my skin flip the frak out @ the oddest things (the cold/hot, the sun, the air...). aaand that's pretty much it for the bullet pts, until i think of things to add that i won't post about.